Saturday Darrell and I met up with my aunt and cousin and went to LiveCity Downtown â€“ one of the many ways to experience the Olympics for free! 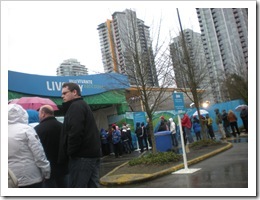 Yes, it was raining, but, being Vancouverites, we were well prepared while waiting in line. At the CentrePlace Manitoba, we learned about the Canadian Museum for Human Rights being built in Winnipeg. Iâ€™d love to be there for the opening in 2012! With all of the road closures, the streets are almost eerie! Iâ€™ve never seen West Hastings so quiet! 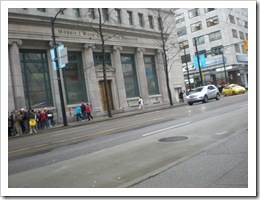 The streets, that is; the sidewalks are another story! I kinda like it though. What are the chances itâ€™ll stay this way? 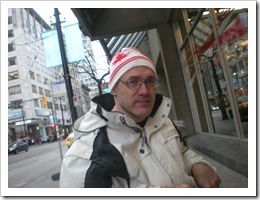 My man in a toque! Heâ€™s still handsome! 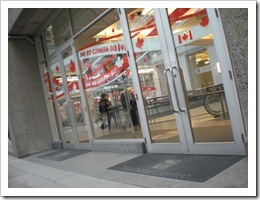 I love how most store fronts have got their â€œCanadaâ€ on! We can show our patriotic colours when we choose to! 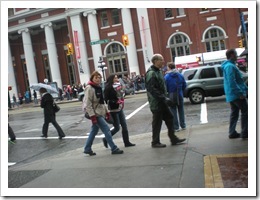 Down in front of Waterfront Station, the sidewalks were like Iâ€™ve never seen them: jam packed with people from everywhere! Welcome. 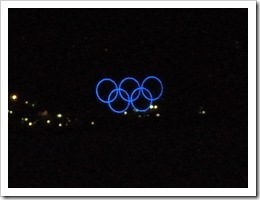 The Olympic Rings floating on Coal Harbour. So cool when seen at night! Disappointedly, the Olympic Cauldron is behind a chain-linked fence; no doubt for security reasons â€“ for both the visitors and the cauldron. After wandering around the waterfront, I finally got a half decent photo. 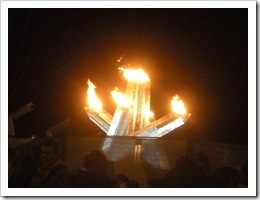 Amazing to think that this flame traveled all of the way from Greece and then across Canada, viewed by millions of Canadians during the longest Olympic Torch Relay in history. 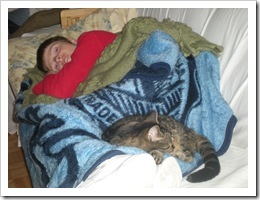 Sunday I enjoyed the Olympics from the comforts of the couch, with my Faith kitty curled up in her spot behind my knees. I had my red jammies on though! hmmm, can I not include a link in here? My comment did not show up. Anyway, I am really enjoying your photos, thanks for sharing! Did you see the Saskatchewan pavilion? Thanks for sharing Glenda!! It would be so neat to see the Olympics up close and personal. Love your pics!! We haven’t seen the Saskatchewan Pavilion yet. I think it’s down by False Creek, on the old Expo land. We’re waiting for Darrell to get new wheelchair batteries before we do our next road trip. Hopefully we can go again Friday. Hey Sherry, thanks! Are you watching the tv coverage too?